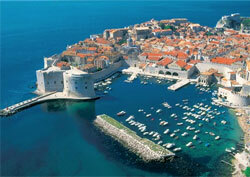 Dubrovnik Old Town - despite its touristy character - remains one of the world's most picturesque destinations. View the facades on the Stratun (description below) and in the maze of narrow back alleys. Nearly all the buildings were erected over 500 years ago and are designed in the Roman, Gothic and Baroque architectural styles. Stroll along the top of the 24 meter (80 foot) high fortified wall that encircles the burg. It takes about an hour and offers perspective views of the city and Adriatic Sea. It's the main street and hub of activity - and is flanked by picturesque buildings and outdoor people-watching cafes. It's a snug, charming harbor with small moored boats (see photo above). Enjoy an eagle's eye view of Dubrovnik Old Town and its environs from a mountain belvedere. Dubrovnik Old Town is no longer the local community it once was. Only a small percentage of its previous native population remains. Today, it's vaguely like a touristy theme park. Visitors - not locals - dominate the scene. And most of the workers you see don't actually live within the walls. The destination is a popular cruise ship port-of-call during the peak summer season. Nearly a million cruise passengers per year go on organized or self-guided shore excursions. To avoid congesting conditions of large-cruise-ship days, do your major-venue sightseeing early in the day before cruisers disembark - or in the late afternoon after most cruisers return to their boats. May through mid-June (before summer temperatures and visitor counts soar) is your best bet. September is a good alternative (though daytime sightseeing hours become shorter).